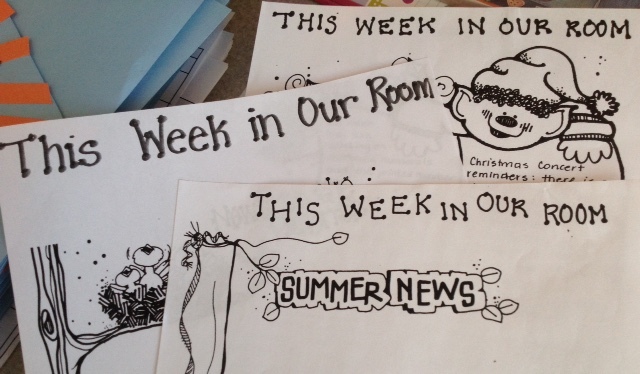 We officially retired our “This Week in Our Room” paper newsletter last week. We’ve now started an online newsletter that we will write and post on this website on Fridays. We’ll try to write about one or two topics of interest from the classroom, in addition to the usual wrap-up of the week, upcoming events and reminders. We’ve been writing a classroom newsletter every Friday, every school year, since we started teaching. For me, that means since September 1987 (although I missed one year while I was teaching Learning Support). Christy has been teaching in the classroom (mixed in with Learning Support, as well) since March 1994, so we’ve written many newsletters between us. It’s been part of our weekly routine, and one that signalled the completion of a week’s worth of work, well done. We began writing the weekly newsletter as student teachers. Our supervising teachers sent one out on Fridays, and it was part of our teaching responsibilities to write the newsletter every week during the final practicum. You certainly feel like you are the classroom teacher when you’re responsible for the main communication line between home and school. But times are a-changing and there’s a lot of pressure from everywhere to send out newsletters and bulletins electronically to reduce paper and be more environmentally responsible. It’s a good thing and makes a lot of sense. In my class, I wrote the weekly newsletter during Friday lunch. I often sit at a table with the children while they’re eating and they are always amazed to see me filling in the page with print. They can’t believe I write a newsletter every week (“Didn’t you write that last week?”) and they sometimes think it’s a lot of work. But I always explain to them the newsletter is for their moms and dads so that they know what’s happening at school. They love to know what I’m writing, so I always read it aloud to them. We know that modelling writing is imperative to encourage children to begin writing themselves. They need to see how much we value this process, similar to reading. For some light lunch conversation, I would ask my little table group for ideas I might write about in the newsletter; they were delighted to make suggestions, watch me write, and read it back for their approval. Children really want to know what the words say. It’s also fun when I’ve already written up an idea they had. It shows we’re all thinking the same things are important. 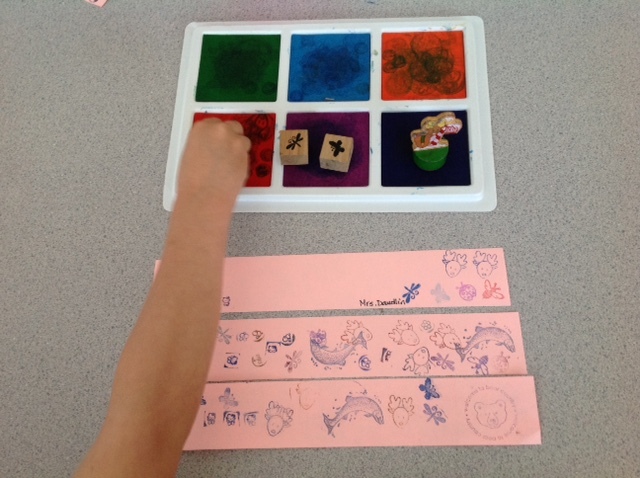 The children are learning a sense of ownership from participating in the writing process, even just at the idea stage. They haven’t seen us writing yet on the iPad (we’re currently using Pages for writing all the posts on The Self-Regulated Teacher, but will probably switch to Google Docs soon) since we’ve transitioned to our online newsletter, but that time is coming and we’re sure an interesting conversation will revolve around it. These activities are going to be the most fun when you sit down with your child, so enjoy this time together and write-on! This entry was posted in Kindergarten Basics, Reflections and Musings by thekinderteam. Bookmark the permalink.